By the late 15th century, tarot had settled into the structure we’re familiar with today: twenty-two illustrated trump cards, and four suits with fourteen cards each, including four court cards: king, queen, knight and page. Since trump cards didn’t have numbers or names printed on them, we can’t be certain of their order or what people called each card. Early tarot images may seem exotic to us, but they were very familiar to 15th century card players from wall frescoes, illustrated books, plays and pageants. From the start, all tarot decks exhibited a great deal of consistency. They all had the same twenty-two images we’re familiar with, and no other. For instance, the Star card could depict an astronomer, the Magi following the star of Bethlehem, or a woman holding up a star; but the card was easily recognizable as illustrating the concept of Star. Tarot’s formative years, from about 1440 to 1475, were a golden age of tarot creativity. Wealthy aristocrats commissioned one-of-a kind decks that used the tarot structure for expressing their personal interests, much as tarot artists do today. A few of these decks have survived in museums, and reproductions are available for collectors. In 1465, Count Matteo Maria Boiardo of Ferrara used Tarot to comment on the nature of love. His trumps were named after human conditions like Idleness, Reason, Desire and Secrecy. The cards of the four suits – Eyes, Whips, Darts and Vases – are described by three-line poems conveying a sometimes cynical message about love. The poems were published in Venice in 1523 and the cards were illustrated by Maurizio Bonora in 1995. The Sola Busca deck was probably created in Ferrara in the 1470s or 1480s. It’s the only complete 78-card deck we have from the 15th century, and it’s our best proof that the deck structure we have today had become standard at this early date. This was a one-of-a-kind deck with military generals, Roman heroes and biblical figures on the trump cards. It’s also the first engraved deck, and one of the first decks to have illustrated pip cards. These illustrations inspired Pamela Colman Smith when she designed the Rider Waite deck in the early 1900s. 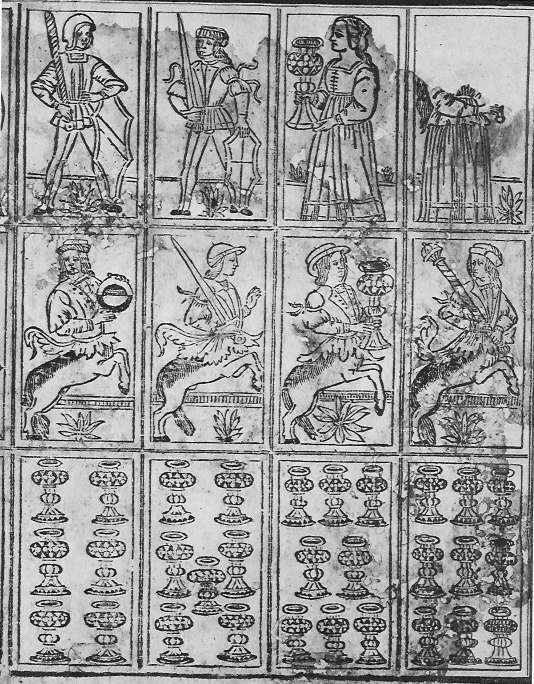 No inexpensive wood block playing cards survive from the 15th century. Our only evidence for what these cards may have looked like comes from uncut sheets of cards dating from about 1500 that were unintentionally preserved because printing mistakes made them unusable. Instead of cutting the sheets up into individual cards, the printer used them as filler or end papers in book bindings. These unused sheets of cards were preserved with the books, and several have found their way into museums. It’s still an open question which came first. Were the luxurious hand painted cards modeled on mass produced tarot decks, or did a printer model his inexpensive block printed tarot deck on the aristocratic hand-painted pattern? Since the physical evidence is so sketchy, we can’t be sure which came first, or how closely the aristocratic hand made decks resembled the cards used for game playing. 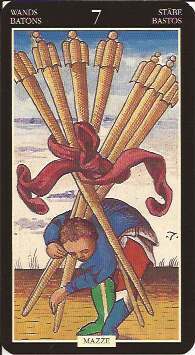 Historians used to think Tarot de Marseilles (TdM) pattern was invented in France. But early in the 20th century, two possibly Italian precedents for these distinctive TdM images were discovered. A sheet of uncut cards from about 1500, believed to be from Milan, and now in the Cary collection at Yale University, has the distinctive Tarot de Marseilles lightning-struck Tower, the Star woman pouring water from two jars, and the Moon with two dogs, towers and a crayfish. It also shows hands holding the suit symbol on all the Aces. These cards seem to be a bridge between their Italian predecessors and early French Tarot de Marseilles decks. When a well at the Sforza Castle in Milan was cleaned out in the early 20th century, numerous playing cards were found at the bottom that were dated to about 1500 and had typical TdM imagery. 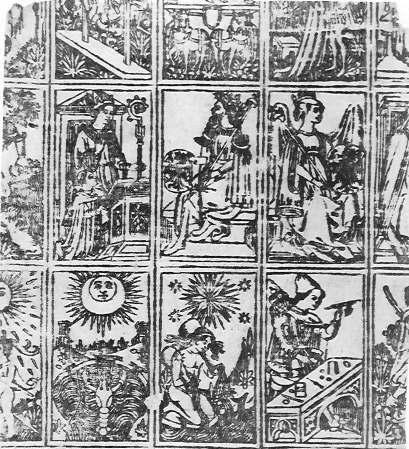 Based on this evidence, tarot historians have concluded that the distinctive TdM imagery originated in northern Italy, probably Milan, and that decks with these images were taken to France by soldiers returning home from wars in Italy, or by Italian merchants and bankers who lived in all the major cities of Europe. On the other hand, it’s also possible that the cards at the bottom of the well came from France with the invading French army. Either way, there seems to be a link between French and Milanese tarot dating to the early 1500s. So few cards have remained from the 15th century that it’s impossible to create a complete story about the lines of influence running between Italy and France. All we can do is connect the dots with the few cards that have survived and hope the story we tell resembles the truth. On the next page, Tarot travels to France.